C.J Wilson is this car enthusiast we know who always seems to have a smile on his face, a camera around his neck, and a gear spinning in his heart. We've been told he also "pitches" for something called the Los Angeles Angels of Anaheim. 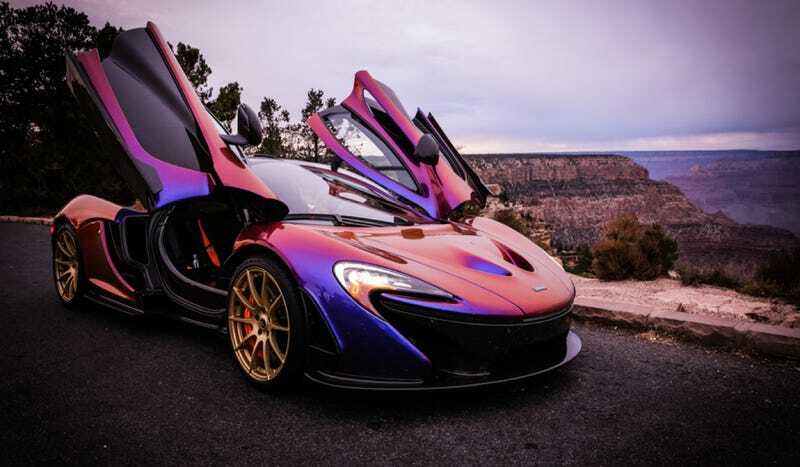 Here's the story of him picking up his amazing McLaren. - Ed. I've been waiting a few years for the P1, but before that as a kid the McLaren F1 was clearly the definition of a dream car. The whole process has been fantastic with McLaren. From my initial inquiry, ordering and ownership of the 12C to the same process on the P1 I've had a chance to get everything out of the experience. Factory visits, test drives, constant emails have all had a huge positive impact. Of course, the longer you wait for something the more impatient you get towards the delivery date. My options were to ship the car or to drive it home on a road trip to the Grand Canyon. So I packed my camera and took delivery in person. Park Place McLaren picked me up from the airport in a Bentley Flying Spur, which just goes to show how far they are willing to go for their repeat customers. Chris Blank went through all the systems and controls on the car, we went on a short test drive. He gave me all the info on how to charge the battery, extend the range, and how to deploy all 903 HP if I felt like it. Seeing the entire car in person for the first time was pretty hilarious. The paint color from MSO is unlike anything I've ever seen on another car. When I got to pick it out in Woking, word got back to Frank Stephenson and he hinted it might be too nuts, but throughout the construction process he managed to send me updates and emails including tons of photos. Everyone fell in love with it; bold and unique, wacky and gorgeous. Frank's design is showcased by the way the colors bend the light around the curves. In broad daylight, it has reflections of orange and red while at night it mainly reflects blue and purple. You have to see it in person or on video to truly appreciate the shift, but each hue has gorgeous tones and with the curves of the car it really does look like the futuristic spaceship from my childhood memories. Cars like this make you feel like a kid again. Heath Strayhan and Chris Blank were fantastic in the delivery process and were really eager to hear how it is to drive a car like this such a long distance right out of the gate. I was a bit nervous to get going but made sure to go through all the questions and double check my inventory. From the McLaren store I went to visit my friend Mark who works at the local Lamborghini shop. I was in the parking lot for about 15 seconds before getting everyone in the store out into the parking lot taking photos and obligatory selfies with the car. I drove over to DFW to pick up my wife, who just started laughing and walking circles around the car with her iPhone. We squeezed into the carbon fiber and alcantara seats and headed towards Albuquerque. Each fuel stop was full of questions, photos and smiles. Sure, you can take photos. Yep, it's a McLaren. No, the F1 has the seat in the middle. 903. Yep. Yes it is fast. No I haven't gone 200 yet. She is a car nut like me and loves the noise and was blown away by the accelerating despite going for rides in fast cars and her prior Porsche Driving School seat time. ME: Is it because my car is purple? The first one was a warning for going eight mph over the speed limit and a photo request. The next was in New Mexico — I saw the SUV and wasn't speeding but he pulled me over anyway. We had some complaints about a black sports car... officer you can see that my car is clearly not black. Or grey. So, no tickets. Taking the car through the desert sunsets and into the Grand Canyon was a great experience. We were only able to shoot a few angles because people kept walking up to the car for photos but since Liz and I had never been we were glad to experience the enormous views anyway. Even some of the local deer were confused, one almost walked into my car while we were parked at a stop sign. Driving back was pretty simple with just stops for gas and one for In-n-Out burger. The car is a showstopper and everywhere we parked we got hounded. Nobody recognized me or Liz and some people had no idea what the P1 was. You start coming up with funny answers after the 80th repeat questions: Who builds it? English people with polo shirts. Where is it from? The future. Is that a lambo or something? Eh... How much does it cost? What is insurance on that thing? Answers to the most common questions: It's from the future. The hybrid tech is amazing. It handles better than any car I've ever driven. It's faster than a Carrera GT with a turbo. It feels faster than a Veyron. It's just as user friendly as the updated 12C. Full electric mode is great for fuel economy and we got great mileage. It's impossible. But it is real. 1500 miles and 10,000 splattered bugs later... it was worth waiting 22 years for McLaren to do it again. When not living our dream lives, C.J. Wilson runs a racing team, plays professional sports, takes photos, runs a few businesses, and... oh wait, it's all our dream life.